At the Jane Austen Festival Australia (JAFA) in April 2012, I had the opportunity to attend a workshop run by Aylwen Gardiner-Garden, making a Regency lettercase to hold love-letters. Aylwen, with the help of Kleidung 1800, instructed us in the basic pattern and embroidery of some original examples of lettercases from this era. 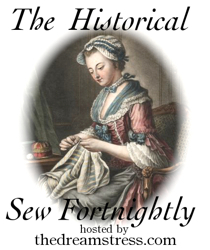 I have since discovered that there are instructions for how to make a Regency lettercase in Jane Austen’s Sewing Box, by Jennifer Forrest, though from the pictures I have seen it is a different design. My lettercase is made from cream silk, backed with cotton to stabilise the material during embroidery. 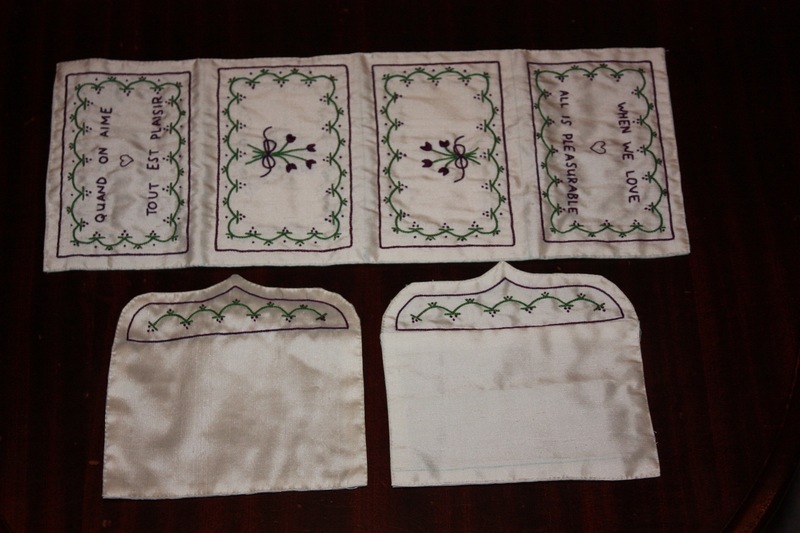 It is embroidered with a purple and green thread, mostly in a small chain stitch and french knots, with a little bit of back stitch and satin stitch as well. It is lined with a layer of white cotton voile. After much deliberation, I eventually came up with my own embroidery design by searching through the diagrams of embroidery designs that were published in Ackermann’s Repository from 1816 to 1825. 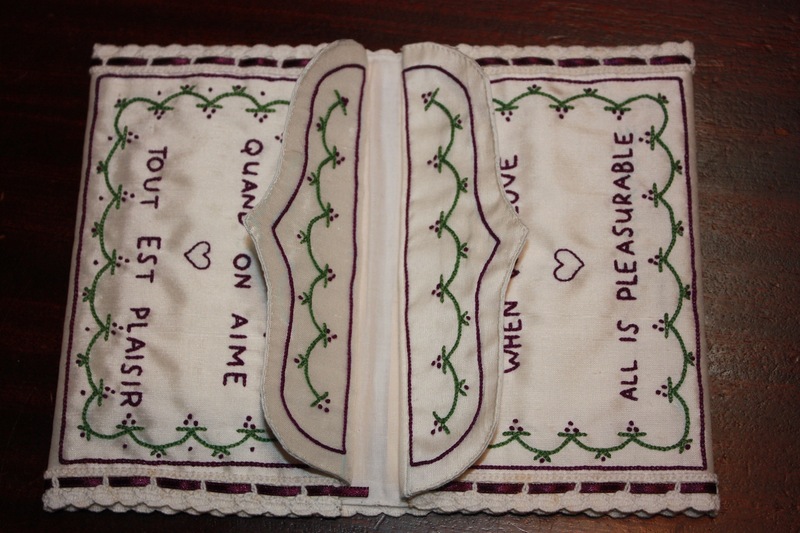 I also decided that, as well as embroidering a French saying on it, I would add an English translation. To give the lettercase a bit more rigidity, I inserted two thin pieces of card inbetween the lining layers of the two sections that would face the outside (i.e. the front and back, the ones embroidered with a bouquet of tulips). In order to stop the silk fraying, I folded over all the raw edges and hand stitched each piece to its lining with a small running stitch before I assembled the pieces together. I then layered and folded the pieces together to form the lettercase and bordered the side edges with a thin piece of white crocheted lace interwoven with dark purple ribbon. I hand-sewed along these side edges, through all thicknesses, to form the inside pockets. The finished lettercase opens in half to reveal two pockets on each side – one in front of each flap and one behind. I cannot honestly say how useful these items would have been in the eighteenth century or Regency times, as people received a prodigious amount of mail whenever they were separated from others by even a small distance. My understanding is that letters would generally be packaged up, maybe tied in bundles, and then stored in boxes either for future reference or to be passed on to future generations. In Madame Bovary (1856), Emma Bovary stores her letters from her lovers in a box in the attic. In terms of storage, this type of lettercase would not hold very many letters, maybe 10 at the most, so it could have been more of a way to carry letters or documents to show others. Sarah Hurst (in 1759) often took the letters she received from her beloved to show to her friends. Mine might hold the love-letters written to me by my husband, although these are admittedly not very numerous. I do regret not making my lettercase large enough to put a modern Valentine’s Day or anniversary card in it! I might have to get my husband to write me a little poem instead! 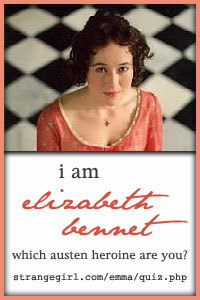 My Regency Journey: The Destination – JAFA 2012. 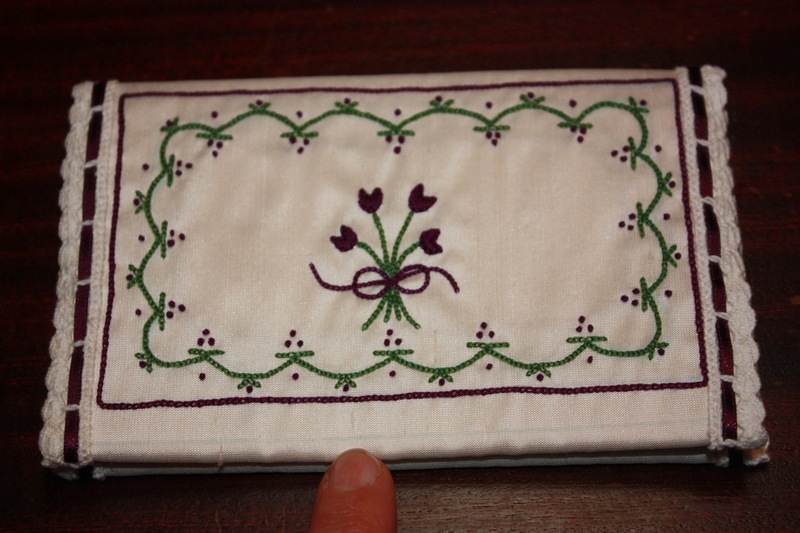 An extant Regency lettercase, lavender with cream embroidery, around 1800. An extant early Regency Silk Purse, pink with beige embroidery, 1780-1800. A late Eighteenth Century lettercase, red with white embroidery – hopefully you can see it, as I did, on page 76 of this book, Fashion: The Collection of the Kyoto Costume Institute, A History from the 18th to the 20th Century, as it is available through a preview on Google books. 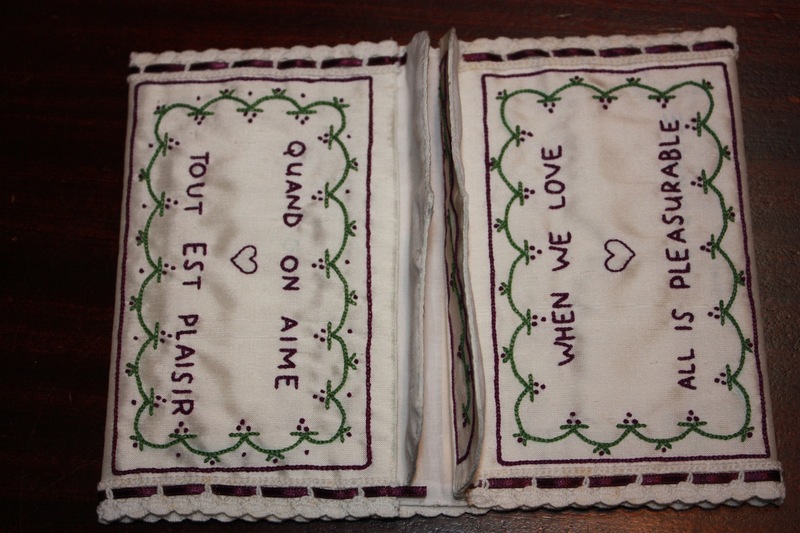 A Lady’s Pocket Book or Letter Case, cream with coloured embroidery, 1780-1800. Man or Woman’s Pocket Book, green with coloured and gold embroidery, 1700-1750. Pocket Book with a lock of hair, cream with coloured and gold embroidery, 1760-1780. I have often heard people say that when they see embroidery! But to be honest, with a bit of hand sewing when you watch TV in the evening, it is surprising how fast it all comes together! I (in general) have disliked embroidery, but I have persisted and improved my technique, and now I find it quite relaxing. Though I don’t usually attempt anything to complex or beyond my skill level!